Recent research suggests a cure for equine anhidrosis, tying-up and more, based on findings that such negative effects on horse health result when electrolytes don’t always perform as they’re supposed to. Mesa, AZ (Apr. 26, 2011) – Electrolytes are involved in every physiological process in the horse’s body including hydration, blood pH and maintaining normal muscle function. The typical equine diet of hay and grain usually provides all the electrolytes a horse needs but good health depends on how those electrolytes are balanced. Researchers are now focusing more attention on electrolyte activity, rather than just level. When comparing healthy horses to unhealthy ones, they’ve found that simply providing electrolytes does not guarantee they’ll work properly. Abnormalities in electrolyte activity have been linked to tying-up and equine anhidrosis. In Veterinary Dermatology , researchers from Glasgow Caledonian University and Michigan State University published findings that anhidrotic horses secrete chloride ions differently than normal, healthy horses do. Defective electrolyte transport mechanisms in the gland are likely responsible. HERDA – Hereditary Equine Regional Dermal Asthenia – Buyer Beware! HERDA – Hereditary Equine Regional Dermal Asthenia – Buyer Beware! Check the bloodline of any AQHA, APHA, ApHC and cross-bred horses of these breeds before you buy! Check your horses’ bloodlines before you breed, too! This is a heart-wrenching story from a woman whose mare was diagnosed with HERDA. By Tara Flanagan and Robin Davison, March 2011: From across the paddock, Penelope (registered name, Quality Sensation) is a striking four year-old paint mare who has nothing but potential. Her athletic build, to-die-for lope and easy disposition indicate that she inherited all the right things. Robin's horse, Quality Sensation. Click on image for larger view. 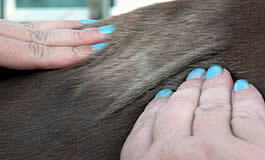 But get a little closer and you’ll notice the discoloration on her back from saddle sores. The skin around her withers feels corrugated. It’s easily manipulated and doesn’t snap back into place –almost as if the horse is severely dehydrated. I bought my mare in November 2009 and had her hauled from Florida to Colorado. Penelope had an injury on her right hind leg from the trip that required a vet’s attention, and which was unusually slow to heal. Mostly, I was filled with the excitement that came with getting the horse I had dreamed about – Penelope and I were going to show at the National Western Stock Show someday. Typical of many horses who are afflicted by HERDA, or hereditary equine regional dermal asthenia, Penelope started to show signs of the disorder when she developed saddle sores that did not heal in March 2010, about two months after she was started under saddle. A DNA test from UC-Davis revealed that Penelope is HRD/HRD – affected – meaning that she has two copies of the HERDA gene. 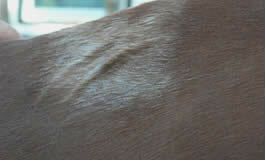 Robin's horse, Quality Sensation, showing the skin not popping back into place. Click on image for larger view. HERDA is found in some descendants of the AQHA sire Poco Bueno. Researchers have named four deceased Quarter Horse stallions that were carriers and produced at least one affected HERDA foal. They are: Dry Doc, Doc O’Lena, Great Pine, and Zippo Pine Bar. These stallions all trace to Poco Bueno through his son and daughter, Poco Pine and Poco Lena. Other breeds affected are the American Paint Horse (APHA), the Appaloosa (ApHC) and any other breed registry that allows out-crossing to AQHA horses. (this information found on http://www.angelfire.com/pa5/ment2befarms/herda.html). As far as the odds go, if you breed a carrier to another carrier you have a 25 percent chance of producing an affected horse (HRD/HRD), 50 percent chance of producing another carrier (N/HRD) and a 25 percent chance of producing a normal horse (N/N). When a normal horse (N/N) is crossed with a carrier (N/HRD), 50 percent of the offspring may be carriers (N/HRD) and 50 percent may be normal (N/N); none of the offspring will be affected (HRD/HRD). I now board Penelope at a local farm, where she enjoys a shady enclosure. It’s too risky to turn Penelope out with most horses, but we have found a few equine companions for occasional turnout. For now, Penelope is doing well. I have learned that these horses can live many comfortable years with the disorder – provided they aren’t ridden and are kept in a very safe environment. From the HERDA document from Dr. Ann Rashmir showing an affected horse. Click on image for larger view. So, what can you do? 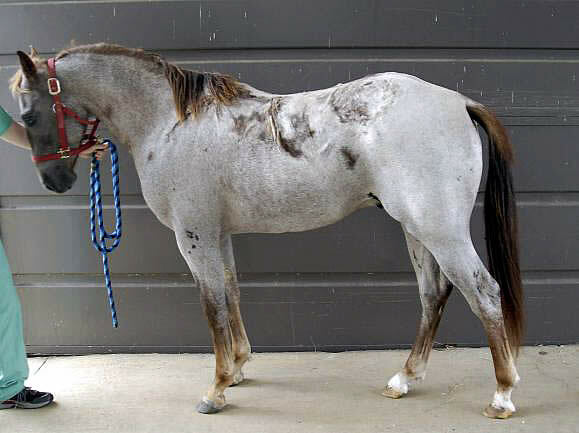 If you plan to buy a quarter horse, paint or appaloosa 4 years old or younger that has several crosses to Poco Bueno, it’s wise to get him/her tested. Require a HERDA test as part of a pre-purchase exam if the horse has Poco Bueno as far back as seven or eight generations. Just looking at the pedigree on registration papers might not be adequate to determine if the horse is at risk. The test only costs $40 (here is the link: http://www.vgl.ucdavis.edu/services/horse.php). And it stands to reason that you can’t produce a HERDA affected horse if you don’t breed two carriers. For more information please contact Dr. Ann Rashmir at the Department of Large Animal Clinical Sciences, College of Veterinary Medicine, Michigan State University G209 Veterinary Medical Center, East Lansing, MI 48824-1314, Office (517) 355-1866. HERDA/hyperelastosis cutis was first reported by Lerner and McCracken in 1978. The DNA test at UC-Davis has been available for 4 years. From the HERDA document from Dr. Ann Rashmir showing a severely affected horse. Click on image for larger view. “My horse doesn’t feel good and I don’t know why.” I’m sure you’ve heard this phrase or even said this yourself many times. We are so close to our horses. We feed them, clean them, ride them, work them and observe them. We even sleep with them when necessary. They can’t make a move without us knowing something is wrong. So, how do we know what’s wrong? If we can’t pinpoint the problem, out comes the fast dial to the vet. But what if the vet doesn’t necessarily find something wrong? What now? An Equine Iridologist (EI), of course! 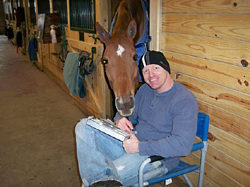 “What the heck is an EI?” you ask, “How can they tell me what’s wrong with my horse?” To first understand Equine Iridology, you will need to know a little history on Iridology itself. Iridology was practiced in Ancient Egypt, China, India and by the Early Chaldeans thousands of years ago where the practice of reading the iris to reveal existing or potential health challenges was the norm. It doesn’t require needles, anesthetics or drugs. Many unhappy, possibly spooky, one sided, intermittently lame horses have TMJ (temporomandibular joint) distress. The biomechanics of the TMJ are directly related to a horse’s posture, balance, rhythm, and general well being. The jaw joint is grossly overlooked by horsemen, veterinarians, and even equine dentists. It is the closest joint in the body to the brain and brain stem and is flooded with proprioceptors that tell the body where it is in space. Many dental practitioners are far too focused on smoothing up those molar tables without even considering how their work affects the TMJ. Now with the advent of SO many new power instruments on the market it is easy to get over aggressive with the floating. Even though horses do have continually erupting teeth, there is only so much tooth that can erupt over a year’s time and that amount diminishes significantly as horses age. We see horses in our practice daily that have been overfloated in the molars to the extent that their table angles have been flattened and even sometimes reversed. These table angles are necessary for proper guidance to the jaw joint. It also leaves the horse riding on his incisors (front teeth) with little or NO molar contact. These horses go into TMJ Myofascial pain syndrome trying to clench the muscles that close the jaw in an effort to get their molars back in contact. There are many factors to consider when trying to manage a horse’s weight or have them gain weight. To start with, the feed quality and source of calories within the feed is critical. We all know eating fat promotes gaining fat more than eating protein does. Did you know the quality of that fat affects the health of the cells throughout the body and that eating “bad” fats will decrease overall health and performance? A feed should be palatable, digestible, consistent, and made with high quality ingredients. Next are the teeth. Proper dentition is needed to chew the feed, thereby increasing the surface area exposed for digestion (the “tip” for dental care is coming soon). Then there is the stomach and intestinal tract where the feed is mixed with digestive enzymes and the microflora (bacteria and yeast) that are necessary to break down the food particles for absorption. A deficiency or imbalance of these enzymes, bacteria, and/or yeast, known as dysbiosis, can lead to poor digestion, malabsorption, and weight loss regardless of the feed quality or quantity given. Long term dysbiosis leads to leaky gut syndrome which creates a pro-inflammatory state within the body leading to a wide variety of problems varying from sore muscles and joints to laminitis and/or allergies. Guest: Kathleen Wild Ride – You Might Think This Is Crazy, But… and follow her travels on Facebook. 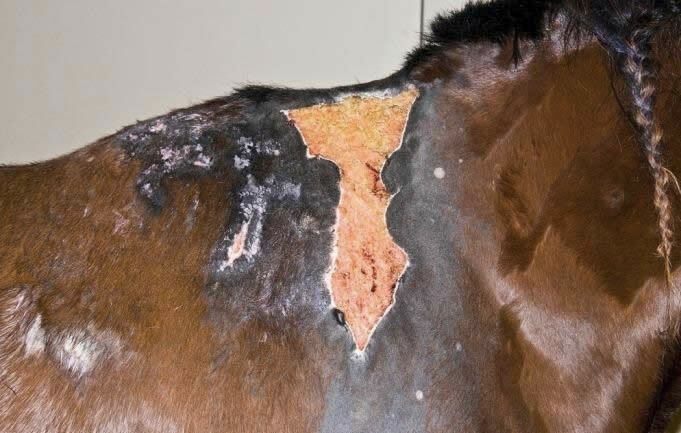 THURSDAY, AUG. 12, 2010 – RALEIGH – North Carolina has joined a growing list of states with cases of equine piroplasmosis, an animal disease the U.S. was free of for 20 years, Agriculture Commissioner Steve Troxler announced today. Tests of blood samples submitted to the National Veterinary Services Laboratory in Ames, Iowa, confirmed the presence of EP in 11 horses in four locations. North Carolina joins 19 other states that have identified cases of the disease in the past two years. State veterinary authorities immediately quarantined the premises where the horses resided. The quarantine means that no horses can be moved from these locations. The N.C. Department of Agriculture and Consumer Services is conducting an investigation to determine the source of the disease and whether it has spread beyond the locations where the infected animals were housed. 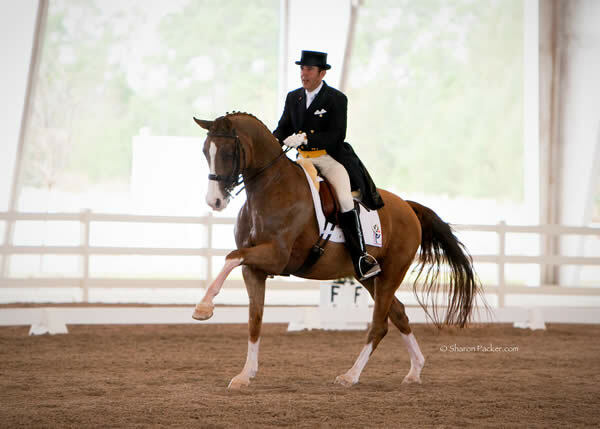 Whitehouse Station, NY – Your Health 321, LLC, independent distributors for a company specializing in adult stem cell nutrition, providing optimal health and superior performance for horses, is pleased to announce they are a sponsor of Dr. Cesar Parra, international dressage rider, trainer and instructor. Parra was one of Colombia’s top international riders before becoming a US citizen in 2008. Parra’s recent win on Dr. Lori Washton’s 13-year-old KWPN gelding Olympia at the Prix St. Georges with a score of 71.789 and the Intermediaire-I with a score of 71.000 percent has put Olympia’s ranking at number one for the FEI small tour. Parra and his team are very excited to have been invited to attend Gladstone Championship in August, with hopes of qualifying to represent the US at the Pan American Games held in Mexico next year. On another note, Grandioso scored in the 70% in the Intermediaire II and Whoopie Gold won her 2nd level test 1 with a big score of 76% with Nadine Buberl riding.